All right, as a certified shoe-liker, if you know me, I have a pretty good amount of sneakers, but I do wear them. I'm not the type that "collects" anything, and I think I'd look pretty silly when I'm 90 years old wearing my "vintage" pair of Jordans. So with that being said, I do love the hookups I do get from my friends and family, (my fav stores being Proper in the homeside of LBC, and in the 2nd home of Honolulu both Kicks HI stores and In4mation/Aloha Army). So besides my babbling about what stores I consider F&F, alot of my friends and family ask me to let them know of any good things going on in the fashion and shoe world. Well, I do admit, I'm a sucker for a good deal, (well I'm not a sucker but you know what I mean), so here's a good hookup from the "major shoe chain" Foot Locker. 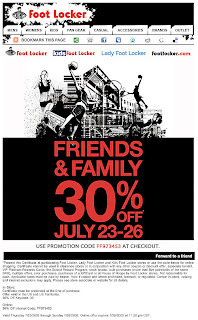 Now I don't have any friends or family in the Foot Locker organization, although my hoops league does have 2 guys every weekend that look like FL employees and treat me like a step child as far as calls go, but with bad refereeing aside, I'm letting you know that there is a great Friends and Family sale at Foot Locker happening in the next 3 days.